As cabinet manufacturers experience the first signs of increased orders, old problems still seem to haunt. Incomplete orders, partial specifications and even the occasional missing specie or door style are par for the course as manufacturers continue the madness of rekeying their dealers’ orders. And it’s only going to get worse. As customer service departments chase dealer salespeople down to correct information, time drags on – and the consumer experience worsens. Buyers today may be starting to spend more easily, but against the backdrop of hellacious buying experiences from manufacturers across the board, the friction in the system is at an all time high. Add in more complex catalogs, more choices and more promotions than ever before and the crap show continues. So what can manufacturers do to get ahead? Start by shattering these ten age-old industry myths that are no longer relevant. Abandon the showroom display myth. Your display in the dealer’s showroom does nothing to tie you to your dealers anymore. Until you get your systems integrated with your dealers, be prepared to be dropped like a rotten sack of potatoes when the “prettier” vendor shows up at your dealer’s business tomorrow. Abandon the dealers will never change myth. Sure there’s always that dealer that will never change because he knows more than you ever will – but in the famous words of dealers themselves – “You can’t beat the stupid out of somebody”. Concentrate on the rising stars and the larger dealers that make up the bulk of your orders and partner with them to help them make the transition to solutions that tie you both together more closely. Abandon the myth that your product line-up distinguishes you. It was true before the market crash, but it is even truer today. A cabinet is a cabinet is a cabinet. Ask any dealer on the planet after they’ve had a beer or two and speaking openly – you’re product line is just like everyone else’s. Abandon the myth that you control the dealer. Dealers are independently owned and operated. From your dealers’ eyes, you’re really no different than their other suppliers. Trying to control your customers not only pisses everybody off, it just doesn’t work. Free your customers to go to market and do things like real entrepreneurs do. Sometimes they’ll surprise you with gifts of more orders. Abandon the myth that it’s too hard. Look around you. Dealers are adopting and changing their businesses virtually overnight. And it’s accelerating. 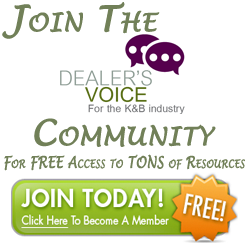 The technology is here already – you just have to harness it for you dealer network. Abandon the myth that design software solves the electronic ordering challenge. Design software is not an ordering solution. And if you look inside your dealers’ operations a little bit deeper, it will become painfully obvious why ordering from design software has never worked – and never will. Abandon the myth that blind promotions are working. In our electronic ordering platform, we tag the promotion that was used on an order so manufacturers can tie the loop back to their marketing efforts. If you’re blind to what promotions were used on what orders, you’re throwing money away. Either that or your dealers are keeping it to improve their margins. Abandon the myth that rekeying your dealers’ orders is a cost of doing business. If you’re still rekeying your dealers’ orders, you really are insane. Your number one mission in 2009 should have been to eliminate that. Rekeying and manually correcting your own crap show doesn’t scale and will literally evaporate your margins. Abandon the myth that your coop programs are effective. Dealers don’t care about your crazy coop rebate hassles. And they aren’t placing ads with your logos in newspapers anymore. Use coop dollars to help dealers streamline their sales, marketing and operations. If you’re writing off large portions of your coop each year, your cost of missed opportunities from not deploying that capital is off the charts. Abandon the myth that you are a decent software company. Building software solutions dealers will actually adopt takes millions – no matter what that vendor’s initial quote commits to for your project. Save yourself the wasted dollars and failed promises and try to stick with what you’re really good at: making cabinets. If you’re custom building an ordering solution yourself or with a vendor, abandon it. If it’s not already months late, it will be soon.